Porphyry. (Gk. porphurites -ura = purple). 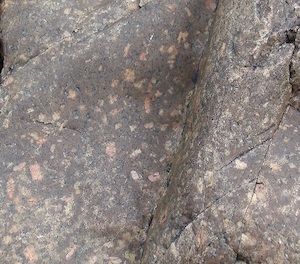 Feldspar porphyry in felsite dyke, Le Pulec. Porphyritic feldspar dyke, Le Nez (Green Is.). A porphyry is generally a minor intrusive igneous rock which consists of more than 25% large crystals (phenocrysts) in a finer crystalline groundmass. The phenocrysts are generally orthoclase feldspar but quartz varieties also occur. The purple connection is because it is named after the widely used ornamental rock - porfido rosso antico (Whitten & Brooks, 1972, p. 359) with the distinctive purple-red colour, which was associated with the medical condition - porphyria. The word is also used as an adjective - porphyritic - when describing a rock type with large crystals in a finer crystalline groundmass, for example, porphyritic granite. In Jersey, porphyries are found mostly in the Jersey Main Dyke Swarm in the Southeast and Southwest Igneous Complexes. They vary from grey to pink feldspar - quartz porphyries (or porphyritic microgranites) found in the cores of the many composite dykes in the south east, for example, in the outcrops along the beach from La Motte (Green Island) eastwards to Le Hocq. A different type, a brown feldspar porphyry crops out striking E-W below Le Nez Point (Nichols & Hill, 2004, p. 53). At the same locality, there are striking bands (layers) of porphyritic diorites with large black hornblende crystals in a finer white to yellow feldspar groundmass. Further west at Le Croc Point, similar rocks occur, described as appinites (Lees, 1990, p. 277). In some places these may also look like micropegmatites. Grey feldspar - quartz porphyry dykes and veins also occur having intruded the Jersey Shale Formation from the Northwest Igneous Complex in the inlet at Le Pulec. Porphyritic granite crops out in a narrow band as one of the granites in the Southwest Igneous Complex and is named the La Moyegranite. Large crystals (megacrysts) of light grey to pink orthoclase feldspar occur in a matrix of finely crystalline quartz and feldspar and minor biotite (similar to the adjacent aplogranite). In the quarry at the site of the former Portelet Holiday Hotel, a dyke of grey feldspar porphyry, striking E - W, crops out at the base of the rear wall. The feldspars are pink to white and the felsitic groundmass shows changes along the margins. The Northwest Igneous Complex also contains a porphyritic granite extending from west of PlÃ©mont Point to the west of La GrÃ¨ve de Lecq, distinct from a coarser outer granite (Brown et al, 1990, p. 195-6) and two others in the complex. Again, this consists of large crystals of orthoclase feldspar in a finer crystalline groundmass. 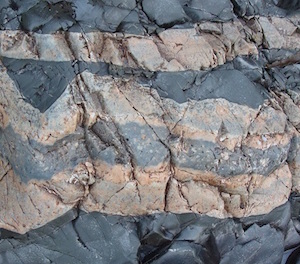 The andesites of the Jersey Volcanic Group are also porphyritic rocks. They are mainly dark grey rocks but vary to dark green with white feldspar laths which can easily be seen in the walls around the ring road of St. Helier and in the lane down from Highlands College. They are well weathered in places and have a fretted and porous appearance. The phenocrysts are plagioclase (andesine) altered to albite by hydrothermal sodium-rich solutions, described as having "keratophyric mineralogy... a result of propilitisation rather than regional metamorphism" (Bishop & Bisson, 1989, p. 14). The St. John's Rhyolite is also described as porphyritic with the ignimbrites, for example, the Jeffrey's Leap Ignimbrite containing phenocrysts of corroded quartz, perthite and albite feldspar laths, and the xenoliths consisting of pink porphyry of the same phenocrysts. On the north coast, the Bonne Nuit Ignimbrite contains phenocrysts of quartz, perthite and albite, while xenoliths of porphyritic rhyolite occur in the Frémont Ignimbrite. Brown, M. Power, G. M. Topley, C. G. & R. S. D'Lemos, R. S. 1990. Cadomian magmatism in the North Armorican Massif. p. 181 - 213, in The Cadomian Orogeny. Eds. D'Lemos, R. S., Strachan, R. A. & Topley, C. G., 1990, Geological Society Special Publication No. 51. Geological Society. London.